After weeks of meetings and hundreds of comments and emails, Port of Columbia County commissioners voted unanimously Wednesday, Dec. 12 to approve a lease amendment that will allow more types of oil products to be transported by rail and ship through Columbia County. A lease amendment with Cascade Kelly Holdings, which now operates as Global Partners LP, will allow the oil transloading company to ship more dense oil, with American Petroleum Industry ratings of 18 to 44. Before Wednesday's vote, Global was limited to an API gravity of 30 to 44. The new API range gives Global Partners more flexibility in the products it can ship, including heavier grades of crude oil than the company's previous lease allowed for. Global operates the Columbia Pacific Bio-Refinery at Port Westward Industrial Park in Clatskanie. The bio-refinery previously handled Bakken crude oil, before switching its facility to transport only ethanol in 2016, citing changes in market demands. Around the same time, the company laid off 28 of its workers at the bio-refinery. Global currently has 24 employees at its Clatskanie facility. Now, the company says it needs greater flexibility in responding to market demand, triggering the need for an amendment to its lease with the port. "With that flexibility, we can move forward with capturing markets that may allow us to fulfill our expansion plans that were approved in 2015," Catie Kerns, a spokeswoman for Global, stated via email. "That would create not only construction jobs, but also the need for more staff at the facility so as to continue to operate as safely and carefully as we have in the past." Jobs have been a key factor in port discussions. 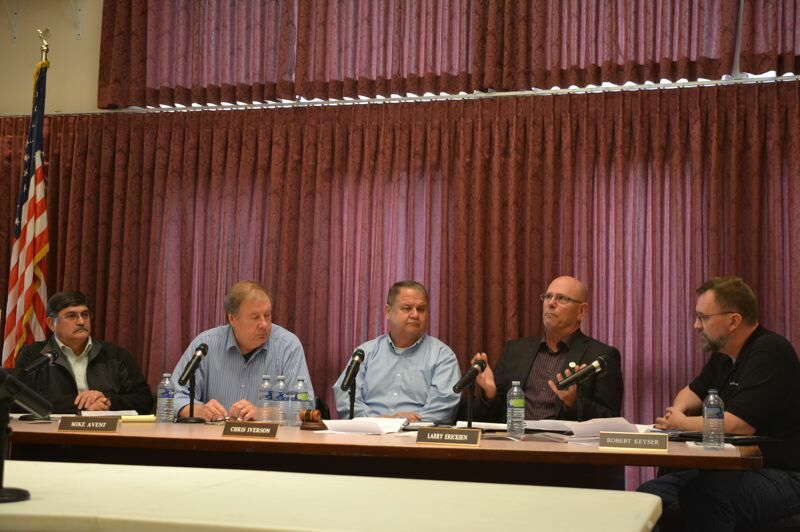 Clatskanie City Manager Greg Hinkelman urged approval of the lease amendment, saying his city is becoming "a ghost town." While the changes could spark demand for labor and increase jobs at CPBR, the port received feedback from hundreds urging the port not to approve any changes that would allow for heavier oils that could create new challenges in the event of an oil spill. Wednesday's meeting was the first time the commissioners and public heard from the Department of Environmental Quality on the issue of fuels used by Global. "They regularly go above and beyond the requirements of the spill response plan," Jennifer Purcell of DEQ told commissioners about Global. But exceeding spill response training requirements isn't a safeguard against a spill with dense, heavy Bakken crude oil, which requires a "dynamic spill response plan," said Scott Smith, who works with DEQ's emergency response program. "There's not binary solutions to some of these problems," Smith said. "[Global's] plan was written at a time when we didn't fully evaluate all the oils that would be coming through the region. The plan was written toward those lighter end crude oils." Smith said oils with a lower API range are usually blended, and dealing with submerged oil in a spill is "an emerging topic" that hasn't been fully examined by DEQ. "The biggest challenge is always finding the oil. It's also extremely difficult to get to. Recovering it, it's extraordinarily sticky once it submerges. ...We'd have to train and plan for that accordingly." Since its last meeting, port commissioners met privately with city officials from Scappoose and St. Helens, who had previously voiced concern about the risks of transporting hazardous oil, increased train traffic and unmitigated impacts from more unit trains of oil coming through the county. 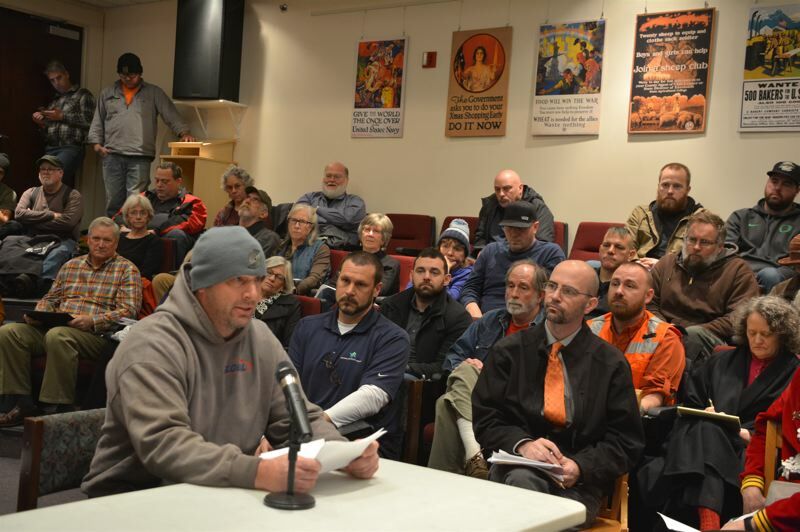 City and school district leaders from Scappoose and St. Helens approached port commissioners again Wednesday, echoing concerns from a slew of residents who said they felt the port wasn't listening to them or taking their concerns seriously. "We're acting as a conduit to come here and try to voice their opinion," St. Helens City Councilor Doug Morten told port commissioners. "There was hate in their eyes; there was rage. So what do we do?" Before voting Wednesday, port commissioners said they felt they had reviewed enough information and feedback to make a decision, noting a meeting among city and port officials with railroad companies and Oregon Department of Transportation was in the works. "My hope has always been that reasonable people can work together to find solutions to facilitate, not only economic development, but environmental concerns, because they're real," Port Commissioner Larry Ericksen said before voting.